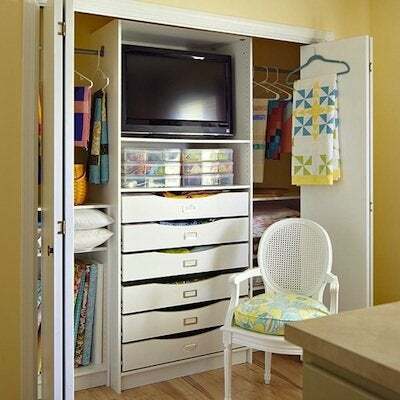 So many closet storage conundrums are solved, not by adding space, but rather by using space more effectively. Though many of us would rather keep the door closed on the subject of closet organization, cleaning up your act storage-wise can yield abundant daily and long-term benefits. For starters, well-organized closets are time-savers: It’s much easier and faster to get out of the house in the morning when you can put your hands on exactly what you need. And you can dig into a new project more quickly when you don’t have to search the house to find all the necessary tools and supplies. Ideally, “You should be able to stand in front of your closet and take everything in at a glance, to see which jacket goes with which pants and which blouse,” says Diana Augspurger, a 30-year veteran of the organization and installation business, and the owner of Creative Storage in Buffalo, NY. Having everything at your fingertips “looks good, feels clean, and is energizing,” she says. While great storage systems could make it easier to sell a house, they could also make it unnecessary to move: The amount of square footage you have doesn’t matter nearly as much as how well you use it. A small house with well-organized closets has room to accommodate more stuff than a larger home with jumbled storage, according to Augspurger. Like many home improvement projects, planning is the most important step in getting your closets shipshape. It’s helpful to have an overview of the way you’d like to use each space eventually, perhaps earmarking future sites for crafts and hobby supplies, sporting gear, or out-of-season clothing. But the good news is that you don’t have to revamp everything at once. This is a project you can tackle over time, spreading out the emotional and budgetary stress. Pick one specific closet as a starting point and set a goal of what you aim to accomplish. Make a list of what you want to store there and consider how the closet is letting you down now. For example, do you need more shoe space? Among the many options are keeping them in boxes on shelves, hanging shoe bags, or floor-standing racks or cubbies. Not enough room for hanging clothing? Lots of closets can easily accommodate multi-level bars; consider leveraging the full height of available space with a pull-down clothing rod. Want more places for folded items like sweaters, pajamas, and underwear? Shelves, drawers, cubbies and even hanging bags can do the job. Big box stores, storage specialty shops, catalogs and the web all offer a huge spectrum of storage options, from the strictly functional to the highly decorative, from wire systems and clean-looking laminates to wooden cabinetry that would be at home in a kitchen or bathroom. Personal preference, available space, and how much you want to spend will influence your choices. With regard to budget, it’s a good idea to keep your budget in proportion with the overall value of the house, Augspurger says. Depending on the size of the job and your skills, you may feel comfortable doing all or some of the job yourself. A simple solution might consist of weeding out items you don’t use, then organizing what remains by adding a shelf or two, a shoe rack, or a simple freestanding drawer system tucked beneath hanging clothing. Get ready to measure—not just the space, but also the items you’ll store. Measure clothing while it’s on the hanger, as garments are longer and wider on a hanger than on the body. If you store your shoes in boxes, measure those too, since large boxes for tall boots may require deeper-than-average shelves. While you’re measuring, take into consideration allowances for drawers and doors that open, or racks that pull down. Make use of overlooked space, adding hooks or shoe bags (the pockets are also great for small items like socks, gloves, and scarves) to the backs of doors. Installing high shelves creates a stash for out-of-season items; as weather demands, you can simply swap out the box of bathing suits, shorts, and tank tops for the box of wooly scarves, hats, and sweatshirts. Use transparent bins, or clearly label each container, so you can find what you need at a glance. And make room in the closet for a folding step stool to enable safe and easy access to the high-up storage. Professional closet organizers will come to your home to talk over your needs, goals, and preferences; take measurements; draw up plans and make recommendations. “I like to see what people are dealing with,” says Augspurger. Before signing on with a pro, ask about their experience, how they learned the trade, and if they’re certified. Some design-assistance employees may be more experienced offering advice as to what will simply fit versus devising a system to best utilize every bit of space. If you’re truly “stufficating” in possessions you can’t seem to part with, some closet-org pros are clutter coaches who can help you shed belongings. It may be easier to let go of things if you feel they’re going to a good home. Consider charitable organizations such as Dressed for Success, which provides business-appropriate clothing to women entering the workforce, or DonateMyDress.org, which offers prom and attire for other special occasions to those in need. Check out local coat drives; church or community organizations that need usable items for fund-raising sales; and schools and assisted-living centers that will accept books, magazines, and art and hobby supplies. If you’re able to sell some of your items at a yard sale, on Craigslist, eBay, or through consignment stores, you may even be able to recoup some of the cost of your spiffy new closet organizers!